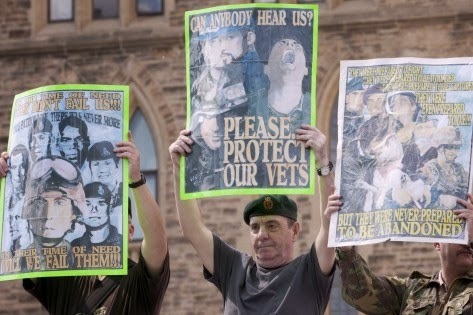 Long thought of as a core constituency of Conservative parties in Canada, veterans have been the target of Conservative cutbacks and slights over the past couple of years. Conservatives are more than willing to hold veterans up as election props, but for whatever reason, have taken to attacking them. Conservative MP Rob Anders arrived late to a meeting to discuss homeless veterans and then proceeded to stretch out, and fall asleep. Homeless veterans don't vote, I guess. Conservative Prime Minister Stephen Harper is proud of the fact that 67% of applications for the Last Post Fund, a fund that helps cover the cost of funerals for veterans, are declined. Even better for Conservatives, the fund provides less of a benefit than is afforded by some provinces to cover the costs of funerals for the underprivileged. Calls for change fall on deaf ears. So entrenched is this contempt for Canada's veterans, local Conservative organizers have taken to attacking veterans groups. Veterans Affairs Minister, Conservative MP Julian Fantino, isn't so sure it's the government's responsibility to look after veterans. He then fails to show up at a meeting to discuss his decision to close Veterans Affairs centres and then blasts veterans for not accepting how unbelievably awesome the Harper Government is. He later apologizes, but vows nothing will change - Veteran Affairs centres will close. Press releases are being sent out by Tory MP's attempting to spin how great veterans have it under the Conservatives and how this is all just a dastardly union plot. Veterans aren't stupid. Conservatives will learn that soon enough.